It all started with the Supermoon. Or maybe it started with a free Saturday evening, or a glass of good red wine, or with the tectonic plate movements that make Mt Coot-tha a slightly more confusing piece of topography than you might think. Or maybe it started with a little pulsing foetus in a feline womb. Beginnings are notoriously tricky. But it definitely started with the Supermoon. It was a free Saturday evening a medium-length walk from Mt Coot-tha, and a glass of good red wine was being sipped in the company of a chicken kiev. Two glasses, in fact – one by me, one by Rachael. Two chicken kievs also. As a chef, I am limited, but I am not ungenerous. And Rachael mentioned the Supermoon. The Supermoon is when the full moon is the full moon but more full and more moon. 30% brighter, apparently, as a result of being closer to the earth than any time in the last eight years. Once news of this had been let slip, it became clear that our Saturday evening wasn’t so free after all. There was a moon to be seen! We dashed from the house with barely a pause to eat three scoops of coffee creme ice-cream and another small glass of wine. There was a Withnail And I derring-do about it. Where to go, where to go, to see the moon? How about closer to the sky? So up we dashed, up towards nearby Mt Coot-tha, from where all of Brisbane may be surveyed on a clear night. A clear night this was not, though the Supermoon’s presence could be felt. It suffused the clouds with argent light. My semi-regular path to the “mountain”-top involves a while on hilly but well-lit roads, followed by a descent then large ascent along a forested path. The road part went fine, but when we got to the path it was just too pathy. this is Queensland, home of snakes and spiders and drop-bears and things that go bump in the night. So we continued on in hope of a clearer route to the top of the road. Though a dead end, this did feature another path branching off to the right. It was a little broader than the first, the home of a little more moonlight. We went in. It was magical. Silver mist, tall thin gum trees, the chirp of crickets and the rustle of unknown creatures. Deepwoods, witchwoods, fog-laced forests. When we reached the top of the path, I, as the local (in terms of residence, not nationality) found myself delegated the decision. Which way to go? I plumped, against my initial instinct, for right. This may have been very wrong, for over the next several decades we found ourselves walking along beatuiful, deserted and roads which were utterly enchanting and were blatantly nowhere near the summit of Coot-tha. Eventually – and I do mean eventually, and also adventurely – lights appeared, in front and above. We hastened forwards. The summit features a cafe and bust-stop, and would certainly be lit. Our pinnacle at last! We sprinted forwards with dash and vigour and a dash of vinegar. We saw a massive poster with three smiling newscasters exhorting us to TRUST NINE NEWS. A huge Eiffel Tower of an aerial stretched away into the night and the mist above us. We had found, not the summit, but the broadcast centre for Channel Nine. A little while later we found the summit again! Dashed forwards again! Saw the huge poster – more newscasters this time – and aerial again. This one was Channel Seven. When we reached Channel Ten we weren’t even surprised. 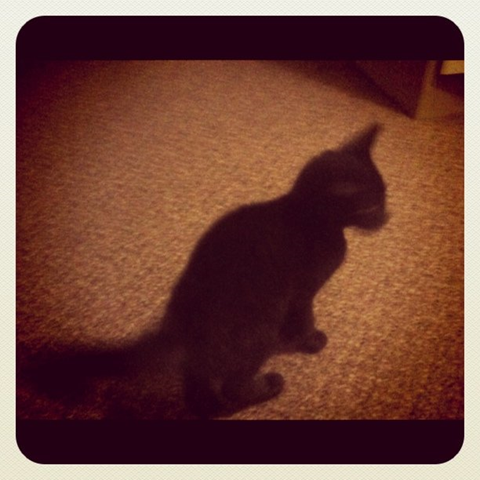 A little black kitten dashed from the hedgerow and began to entwine his little body around Rachael’s ankles. He did mine too, to show fairness of spirit. He was skinny and black with healthy, clear eyes and a tiny white tuxedo-bib. He purred at a stroke. We wondered what to do. It was clear the (amazing, cute, awesome) little guy (actually probably a girl, but we instantly and arbitrarily assigned it masculinity) had attached himself to us. We considered going into the nearby “farm” to ask if they’d lost him, but the “farm” was some kind of 8-acre commercial thing, and not a homely milk-and-potatoes cottage at all. We ummed a little, and decided to walk on. If Kitten was on his home turf, we thought, he’d give up soon and slink back to his familiar hearth. He didn’t. Kilometer after kilometer – literally, really – the little furry dude kept perfect pace with a loping trot. We picked him up when cars swooshed past, and his intelligent face stared with interest out from my or Rachael’s arms. He was the friendliest – he purred, he rubbed, he nuzzled against my beard, he tripped us up by wending through our feet as we walked along. At last, at long long last, we came through the forest and the unknown suburbs beyond, and back into an area of Brisbane we knew, where shops replaced TV stations, houses instead of eucalypts. Kitten was getting tired and hungry – he walked more slowly, was carried more docilely, and then leapt furiously on a crust of discarded bread. Our walk had been long. Setting off at nine pm to see the Supermoon, we had trekked our way through midnight. We came to the 24-hour 7/11 store in Toowong – they had cat food! He wolfed down a small tin furiously in the car-park of an adjacent supermarket. We gasped on soft drinks and wondered whether our clothes were damp from wet cat, or from cat wet. Toowong is two suburbs – another 50 minutes’ walk, maybe – from my house. It also has the RE pub, and the RE pub has a taxirank. For no reason save habit, I’d grabbed my wallet as the went moonhunting – the reason we had cat food. And now the reason we could get home quickly. Ah, capitalism. Rachael spoke to the taxi driver while I slipped into the back seat. Kitten, newly-fed and newly-warm in a fold of my t-shirt, purred quietly for the entire distance. The driver never even knew he was there. And so hunting the moon we found a cat and I’ll be damned if that isn’t an even better thing to find. He slept the night in a cardboard box with a newspaper lining, a bowl of milk and a cloth-wrapped hot water bottle for company. This morning he was taken to the vet’s, where he’s staying the night until one of us picks him up to take him to a shelter in the morning. He’s the cutest, smartest, friendliest kitten. I don’t think he’ll stay in the shelter for long. And that was a story about a kitten, that happened last night, that had footsteps and midnight adventures, and was amazing to live through. And it happened last night, under an unseen Supermoon. Your blog makes me happy. That is a very lovely story. Supermoon gave you a cat – excellent. Are you going to keep him for a while or are you going to leave him at the shelter to be adopted? Cat can haz kitten? Please? I hope ozzie shelters are nice places! Make sure they’re keeping him for as long as it takes to get him adopted, you hear some nasty things about what can happen to “surplus” animals here :'( But as you say, he shouldn’t be there for long! I want a cutest smartest friendliest kitten in the world now. Just in case anyone ever goes to read this story who didn’t see my Facebook update at the time — Summit the kitten was succesfully rehomed. Huzzah!